For parents, everything is of the utmost importance when it comes to their child. From cribs and strollers to clothes and bedding, everything is carefully considered to ensure that only the best is given to their little one. If you’re expecting and are in the process of listing down everything you need to buy, please consider adding diaper bags to your list. The best travel diaper bag should last you many years, from your child’s infanthood to his/her growing up years. Diaper bags can be used to store your baby’s bottles and diapers during the first few months to a year of life. They can be used later on to store your kid’s toys, change of clothes, water bottle, snacks, spare underwear, and other essentials during his or her toddler to preschool years. To help you select the right one for you, we’ve come up with a comparison of three models. Large Pockets – The Pyeta Baby Travel Diaper Bag is great for storing large baby items like toys and bottles. The front pockets can securely hold up to three large baby bottles. Maximum bottle height of 17.5 cm and diameter of 8.5cm. The standard 250ml feeding bottles can fit comfortably and securely in these inner pockets. Easy Access & Multiple Pockets – The Pyeta Baby Travel Diaper Bag has several easy access pockets. The left and right side pockets can securely hold diapers, baby wipes, or baby cloth towels and can be easily accessed for quick use. 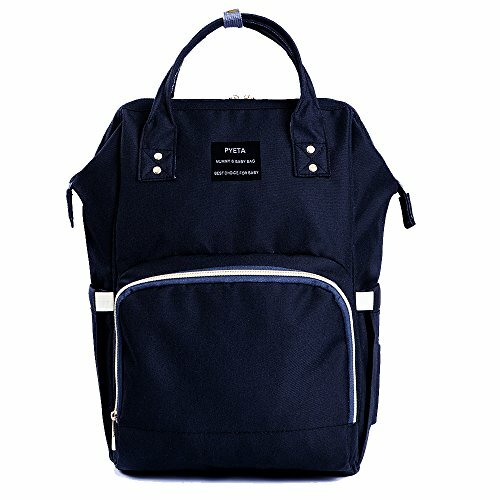 The Pyeta Baby Diaper bag has an additional unique zipped pocket access at the back. Quality and Waterproof Materials – The Pyeta Baby Travel Bag is made of durable, high-quality materials that can last for many years. It is made out of waterproof oxford fabric, a material that allows easy and quick cleaning up of milk and baby food spills. Large and Roomy Main Storage – Pyeta designed their baby travel diaper bag to address large storage needs. The main compartment can hold several clothes, towels, and toys and even an 800-gram milk container. The bag is perfect for long travel with plenty of space to carry all of your baby’s needs. Multi-function and Fashionable – The Pyeta Baby Travel Bag can be used as a handbag as it has a comfortable sling handle or, as a travel backpack since it has padded, adjustable back straps. It also has plenty of color combinations to choose from. The Pyeta baby travel bag doesn’t come with a changing mat. This basic item is not part of the package. 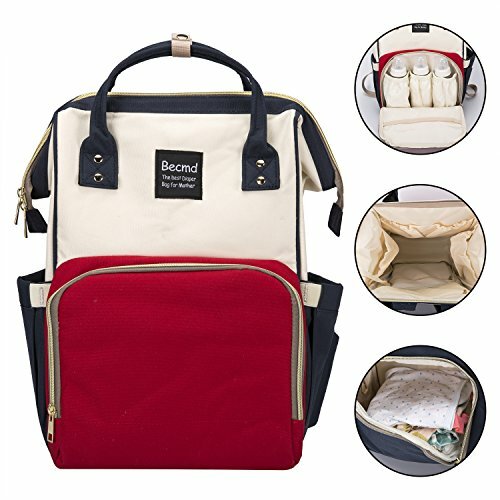 Large Compartment – The Becmd baby travel bag allows storage for large baby items like a towel, an 800-900 gram milk tin can, and even medium- to larger-sized toys. The main compartment has an extra sleeve to hold two or more milk bottles securely. Multiple Pockets – The Becmd baby travel bag is loaded with usable and easily accessible pockets. Left and right side pockets come with a built-in baby wipe or towel dispenser that secures wet baby wipes from drying. The Becmd has a large zipped back pocket access to the main compartment. 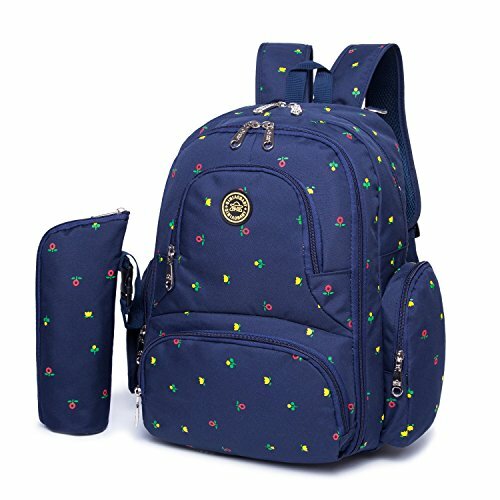 Waterproof Oxford Material – The travel bag is made up of good quality fabric material that allows easy cleaning up of milk and wet food spills. A wet wipe can be used to clean off spills quickly. Multi-function use – The Becmd can be carried as a handbag or as a shoulder bag. The bag can also be used as a backpack with its adjustable and comfortable padded back straps. Insulation – The Becmd Baby travel bag has pockets wrapped with aluminum insulation. It can help to prevent heat loss from food or assist in retaining a drink’s coolness. The diaper bag has no stroller straps. Diaper bags full of baby essentials can be burdensome to carry over a long period. A stroller strap can transfer the load of the bag to the stroller when attached. Waterproof fabric material, easy wash and clean. Multiple Pockets and Storage – The Harfing travel diaper bag is packed with a total of 16 pockets and storage that serve different purposes and functions. The Harfing baby bag has three front panel pockets with insulation. One of the side pockets has easy access to baby /diaper wipes. The other side pocket has an insulating material that can be used for hot or cold bottle storage. Large Capacity Storage – Harfing travel diaper bag provides an ample storage space for baby items which can include several feeding bottles. The main compartment can accommodate an 800 to 900-gram milk tin can and still include several small toys. Waterproof and Easy Washing and Cleaning – The Harfing baby bag is made of impermeable fabric material. It is easy to clean and wash spilled milk powder, baby food, and other accidental spills. Just wipe the affected area with a wet cloth or baby wipe and the bag will be clean. Comfortable Carry Options – The travel baby bag can be carried as a backpack. The straps are adjustable, padded, and comfortable to use. The Harfing travel bag comes with universal stroller straps. Limited Color/Design – The Harfing travel bag comes in only one design pattern and color. Not a Convertible bag – The Harfing travel diaper bag is primarily designed as a backpack. The best travel diaper bag should be able to carry all of your and your baby’s needs. The Pyeta is the complete package because aside from its huge storage space, it also has easily accessible pockets, stroller straps, and is made of waterproof material. Though it does not include a changing mat, it more than makes up for it with its functionality and style. Buyers can also choose from several color combinations to suit their preference.